Muscles of the back can be divided into superficial, intermediate, and deep group. Since the all the back muscles originate in embryo (fetus) form by locations other than the back, muscles in the superficial, as well as, intermediate groups, are extrinsic muscles. Anterior rami of spinal nerve innervate them. Muscles associated and involved in movements of the upper limb belong to the superficial group. The intermediate group might perform a respiratory action and comprises of muscles connected to the ribs. The deep group of muscles is called intrinsic muscles because they develop in the back. They are direct association with actions of the vertebral column and head and are supplied by posterior rami of spinal nerves. Superficial muscles of the back are located directly deep towards the skin along with superficial fascia. They are occasionally called the appendicular group as these muscles are mainly associated with activities of the appendicular skeleton. The superior part of the appendicular skeleton that includes clavicle, scapula, and humerus, is attached to the axial skeleton that consists of skull, ribs, and vertebral column by these muscles. Origin: Spinous prominences of CVII to TXII, Superior nuchal line, external occipital protuberance, ligamentum nuchae. Insertion: Lateral one third of clavicle, acromion, and spine of scapula. Innervation: Motor stimulation is due to accessory nerve [XI], and sensory stimulation is due to sensory nerve endings C3 and C4. Functions: During abduction of humerus above horizontal it assists in rotating the scapula; upper fibers help in elevation, middle fibers help in adduction, and lower fibers help in depression scapula. Origin: Spinous processes of TVII to LV and sacrum, iliac crest, ribs X to XII. Insertion: Floor of intertubercular sulcus of humerus. Innervation: Thoracodorsal nerve (C6 to C8). Functions: Extends, adducts, and medially rotates humerus. Origin: Transverse processes of CI to CIV. Insertion: Upper portion medial border of scapula. Innervation: C3 toC4 and dorsal scapular nerve (C4, C5). Origin: Spinous processes of TII to TV. Insertion: Medial border of scapula between spine and inferior angle. Innervation: Dorsal scapular nerve (C4, C5). Functions: Retracts (adducts) and elevates scapula. Origin: Lower portion of ligamentum nuchae, spinous processes of CVII and TI. Insertion: Medial border of scapula at spine of scapula. Both Serratus posterior superior and Serratus posterior inferior move obliquely outwards via the vertebral column to connect to the ribs. 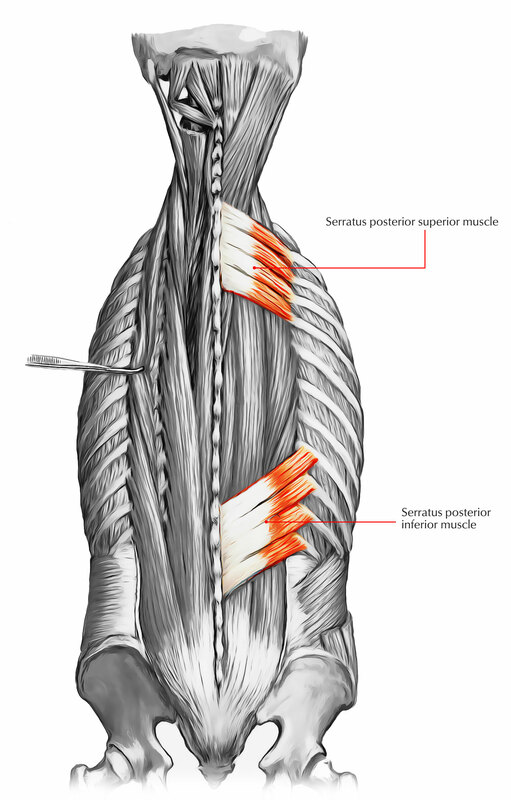 Serratus posterior superior is located deep to the rhomboid muscles, while serratus posterior inferior is located deep to the latissimus dorsi. Both serratus posterior muscles are attached to the vertebral column and associated structures medially and either descends like the fibers of the serratus posterior superior or else ascend the fibers of the serratus posterior inferior to connect to the ribs. 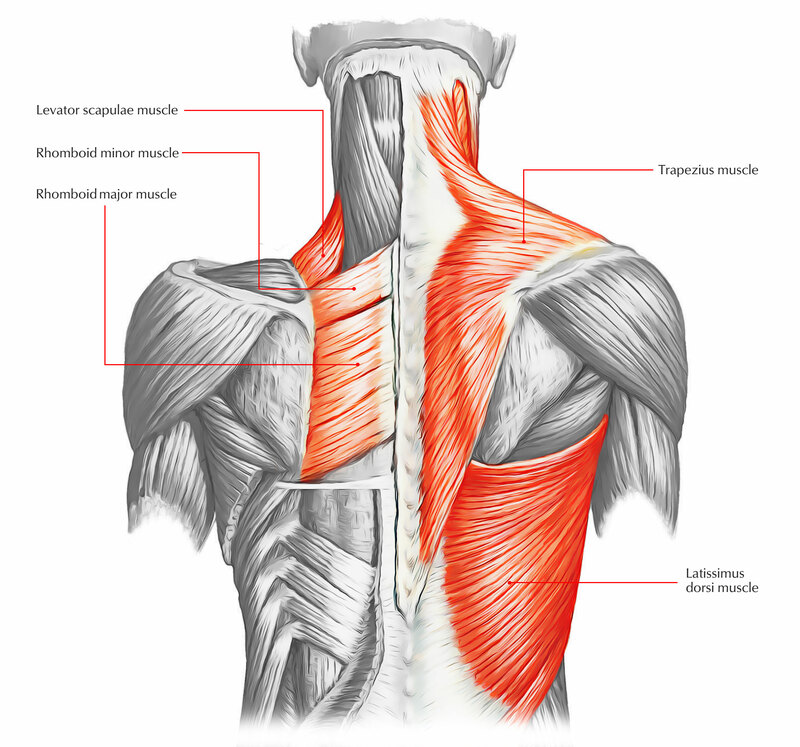 These two muscles elevate and depress the ribs. Segmental branches of anterior rami of intercostal nerves innervate the serratus posterior muscles. Intercostal arteries give vascular supply to them. Origin: Lower portion of ligamentum nuchae, spinous processes of CVII to TIII, and supraspinous ligaments. Insertion: Upper border of ribs II to V just lateral to their angles. Innervation: Anterior rami of upper thoracic nerves (T2 to T5). Function: Elevates ribs II to V.
Origin: Spinous processes of TXI to LIII and supraspinous ligaments. Insertion: Lower border of ribs IX to XII just lateral to their angles. Innervation: Anterior rami of lower thoracic nerves (T9 to T12). Function: Depresses ribs IX to XII and may prevent lower ribs from being elevated when the diaphragm contracts. 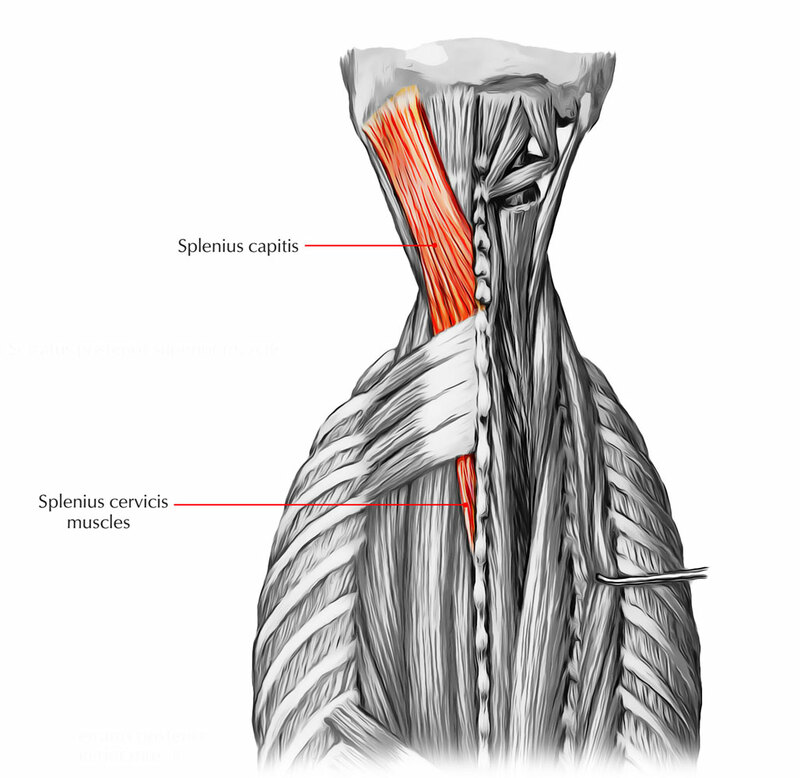 The extensors and rotators of the head and neck: the splenius capitis and cervicis (spinotransversales muscles). 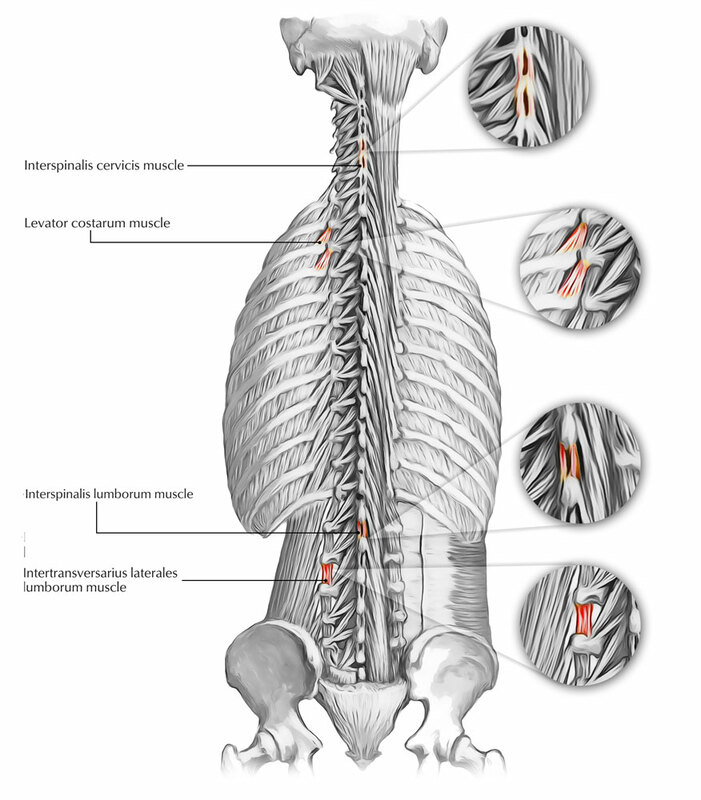 The short segmental muscles: the interspinales and intertransversarii. The splenius capitis is a broad muscle attached to the occipital bone and mastoid process of the temporal bone. The splenius cervicis is a narrow muscle attached to the transverse processes of the upper cervical vertebrae. 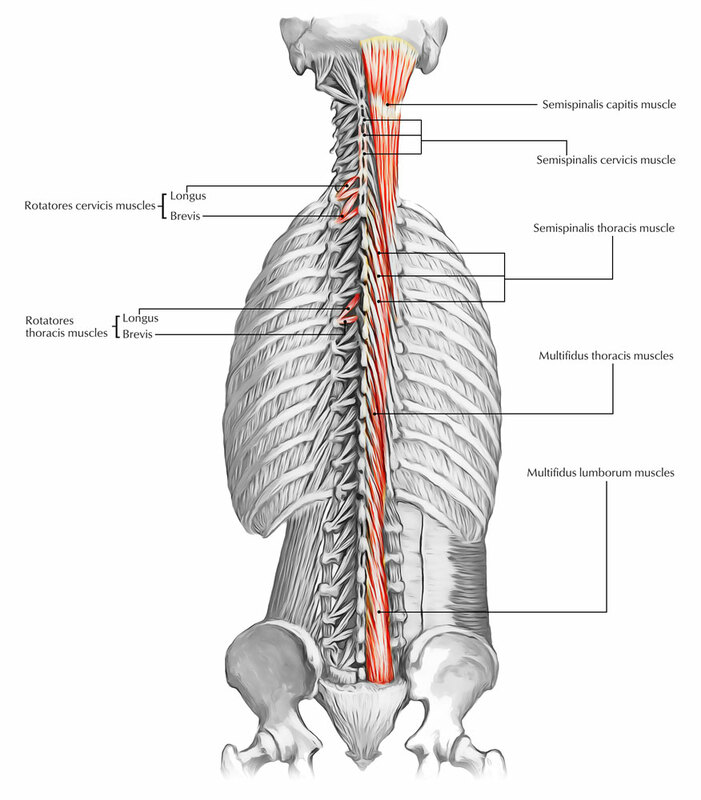 Independently, each muscle turns the head to one side that is the same side as the contracting muscle and collectively, the spinotransversales muscles move the head backward, elongating the neck. Origin: Lower half of ligamentum nuchae, spinous processes of CVII to TIV. Insertion: Mastoid process, skull below lateral one third of superior nuchal line. Innervation: Posterior rami of middle cervical nerves. Function: Together, they draw head backward, extending the neck and individually, each one draws and rotates head to one side i.e. turns face to same side. Origin: Spinous processes of TIII to TVI. Insertion: Transverse processes of CI to CIII. Innervation: Posterior rami of lower cervical nerves. Function: Together they extend neck, and individually they draw and rotate head to one side i.e. same side. Among intrinsic back muscles the erector spinae remains the largest group. The muscles are located medially amid the spinous processes, posterolaterally towards the vertebral column and laterally towards the angles of the ribs. Inside the thoracic and lumbar regions thoracolumbar fascia as well as the serratus posterior inferior, the rhomboid and splenius muscles surround them. It originates via sacrum, spinous processes of lumbar and lower two thoracic vertebrae and their supraspinous ligaments, and the iliac crest; and Insert inside angles of the lower six or seven ribs. It originates in Angles of the lower six ribs and inserts in angles of the upper six ribs and the transverse process of CVII. It originates in angles of ribs III to VI, while Inserts in Transverse processes of CIV to CVI. It starts in blends with iliocostalis in lumbar region and is attached to transverse processes of lumbar vertebrae. While it Inserts in Transverse processes of all thoracic vertebrae, towards the tubercles of the lower nine or ten ribs laterally. It originates in transverse processes of upper four or five thoracic vertebrae and it inserts in transverse processes of CII to CVI. It originates in Transverse processes of upper four or five thoracic vertebrae and articular processes of lower three or four cervical vertebrae and inserts in posterior margin of the mastoid process. It originates in Spinous processes of TX or TXI to LII and inserts in spinous processes of TI to TVIII (varies). It originates in lower part of ligamentum nuchae and spinous process of CVII (sometimes TI to TII) and inserts in spinous process of CII (axis). It originates while blending with semispinalis capitis and it inserts in semispinalis capitis. The transversospinales muscles go from transverse processes to spinous processes occupying the groove between these two vertebral projections obliquely upward and medially. They are made up of of three major subgroups the semispinalis, multifidus, as well as rotatores muscles and are situated deep towards the erector spinae. 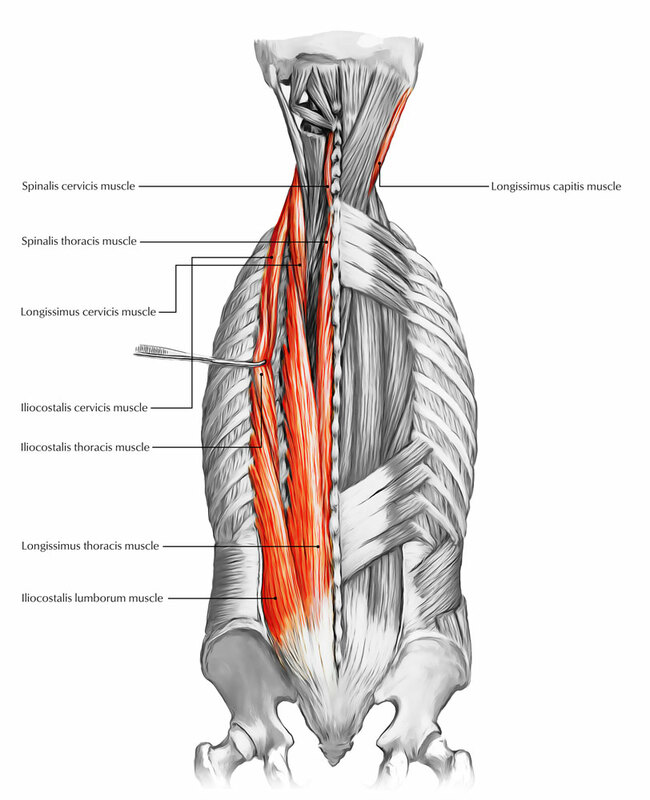 The semispinalis muscles are the most superficial collection of muscle fibers in the transversospinales group. Deep to the semispinalis is the second group of muscles, the multifidus. The small rotatores muscles are the deepest of the transversospinales group. It originates inside transverse processes of TVI to TX and inserts in spinous processes of upper four thoracic and lower two cervical vertebrae. It originates in transverse processes of upper five or six thoracic vertebrae and inserts in spinous processes of CII (axis) to CV. It originates in transverse processes of TI to TVI (or TVII) and CVII and articular processes of CIV to CVI, and inserts in Medial area between the superior and inferior nuchal lines of occipital bone. It originates through Sacrum, origin of erector spinae, posterior superior iliac spine, mammillary processes of lumbar vertebrae, transverse processes of thoracic vertebrae, and articular processes of lower four cervical vertebrae while it inserts in the base of spinous processes of all vertebrae from LV to CII (axis). It starts in transverse processes of lumbar vertebrae and inserts in spinous processes of lumbar vertebrae. It originates in transverse processes of thoracic vertebrae and Inserts spinous processes of thoracic vertebrae. It originates in articular processes of cervical vertebrae and inserts in spinous processes of cervical vertebrae. The two groups of segmental muscles are innervated via posterior rami of spinal nerves and are located deeply in the back. The first group of segmental muscles that arise via the transverse processes of vertebrae CVII and TI to TXI is the levatores costarum muscles. They insert within the rib under the vertebra of origin in the area of the tubercle and have an oblique lateral and downward course. Their contraction elevates the ribs. The second group of segmental muscles are called the interspinales and the intertransversarii, which pass between neighboring spinous processes is the real segmental muscles of the back, which pass between adjacent transverse processes. They stabilize surrounding vertebrae to enable more efficient activity of the large muscle groups in actions of the vertebral column. It originates short paired muscles arising from transverse processes of CVII to TXI and inserts the rib below vertebra of origin near tubercle. Its main function is elevation of ribs through contraction. It originates in short paired muscles attached to the spinous processes of contiguous vertebrae, one on each side of the interspinous ligament and its main function as postural muscle is that it stabilizes adjoining vertebrae during movements of vertebral column. It originates in small muscles between the transverse processes of contiguous vertebrae. Its primary function as postural muscle is stabilizing adjoining vertebrae during movements of vertebral column.